Bakery Sales Associates are people who welcome the customer at the bakery, respond to queries and provide them with information. The typical job responsibilities for these Bakery Sales Associate people are to assist the customers in buying bakery products, understand customer needs, give fresh products, take orders and pack them as per buyer’s specifications. They also need to inform the billing section of the cost and process credit or cash payments for the products that are bought. The other job duties include procuring fresh products, assisting the bakers and supervising the bakers while they are baking and ensure quality check of the bakery products. Summary : Senior Bakery Sales Associate with 8 years of experience is seeking an employment to utilize organizational skills toward developing company's tasks and goals, in a growth-oriented environment which has a potential for career advancement. Greeting the guests and taking the food and beverage orders. Itemizing and totaling the food and beverage orders or rings food and beverage checks into the register. Verifying and recording the identification from standard forms of identification like drivers licenses or passports, reconciling the checks, cash receipts and charge sales with total sales to verify the accuracy of transactions at the end of the work shift. Correctly answering the customer inquiries. Stocking the various products on shelves. Taking the inventory and filling out certain inventory reports. Maintaining a clean and sanitary work area by dusting off shelves, wiping displays/counter, sweeping and mopping. 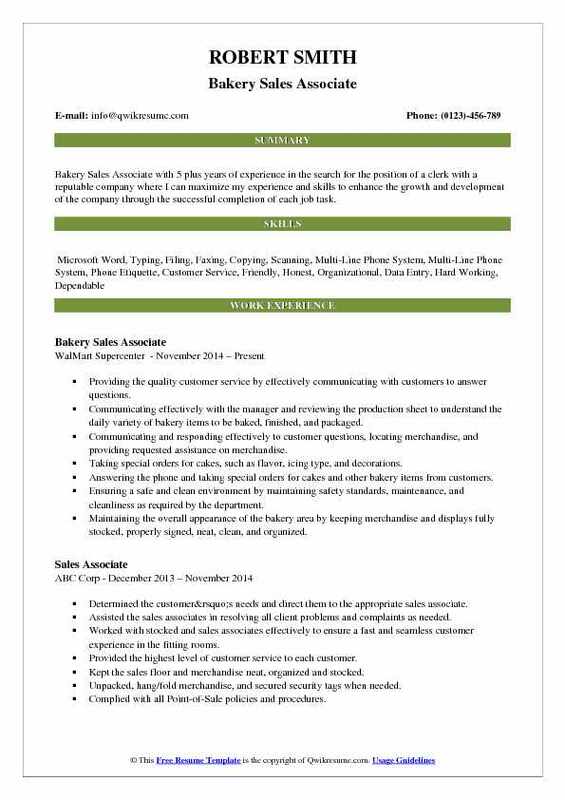 Objective : Positive and focused Bakery Sales Associate with one plus years of experience in the customer service, administrative and sales background. Ambitiously searching for different skills to learn in a new field. Excellent communicator, friendly and adaptable. Self-motivated and a quick learner. Responsible, initiative, punctual and great to work with. Assisted the customer by preparing, baking and packaging bakery products. Ensured smooth workflow within the department by cooperating with co-workers and superiors. Strived to continuously improve job performance and generate sales by suggestive selling and interacting with customers. Followed the company guidelines and state and federal regulations for proper food handling. Used the product handling procedures, and controls damages according to company Standard Operating Procedures (SOP). Provided quality customer service and offering customer assistance. Maintained a positive and friendly attitude and answered all customer inquiries. Adhered to the safety regulations and guidelines while utilizing the equipment. Ensured compliance with health regulations according to the company, state, federal and OSHA requirements. 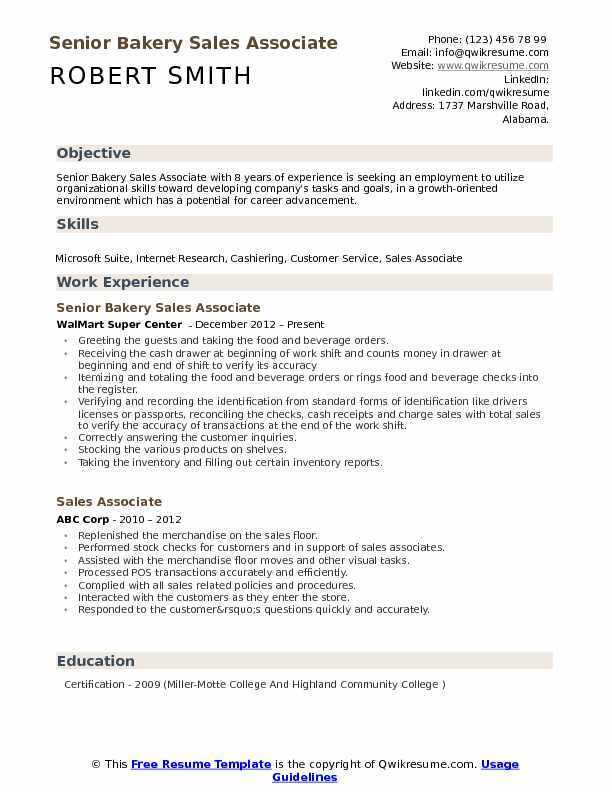 Headline : Bakery Sales Associate with 5 plus years of experience in the search for the position of a clerk with a reputable company where I can maximize my experience and skills to enhance the growth and development of the company through the successful completion of each job task. Providing the quality customer service by effectively communicating with customers to answer questions. Communicating effectively with the manager and reviewing the production sheet to understand the daily variety of bakery items to be baked, finished, and packaged. Communicating and responding effectively to customer questions, locating merchandise, and providing requested assistance on merchandise. Taking special orders for cakes, such as flavor, icing type, and decorations. Answering the phone and taking special orders for cakes and other bakery items from customers. Ensuring a safe and clean environment by maintaining safety standards, maintenance, and cleanliness as required by the department. Maintaining the overall appearance of the bakery area by keeping merchandise and displays fully stocked, properly signed, neat, clean, and organized. Following the established procedures to process damaged goods, merchandise left behind, and outdated bakery merchandise. 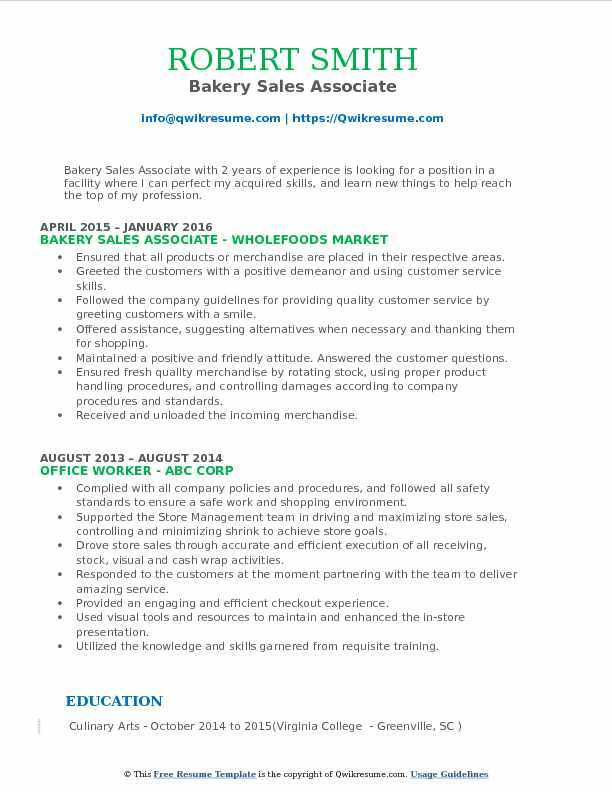 Objective : Junior Bakery Sales Associate with 2 years of experience in taking food orders, operating cash registers and safely handling food while checking for proper temperatures. Hardworking, focused on producing quality food and providing excellent customer service. Solid team player with an upbeat, positive attitude. Dedicated Customer Service Representative motivated to maintain customer satisfaction and contribute to company success. Closely followed standard procedures for safe food preparation, assembly, and presentation to ensure customer satisfaction. Frequently washed and sanitized hands, food areas, and food preparation tools. Assisted management with monthly inventory control and weekly stock ordering. Monitored cooking completion times for efficient use of ovens and other equipment. Properly labeled all signs for mixes, weights, and measures with accurate information. Offered product samples and answered product questions for wholesale customers. Managed the department operations in accordance with established department standard practices. 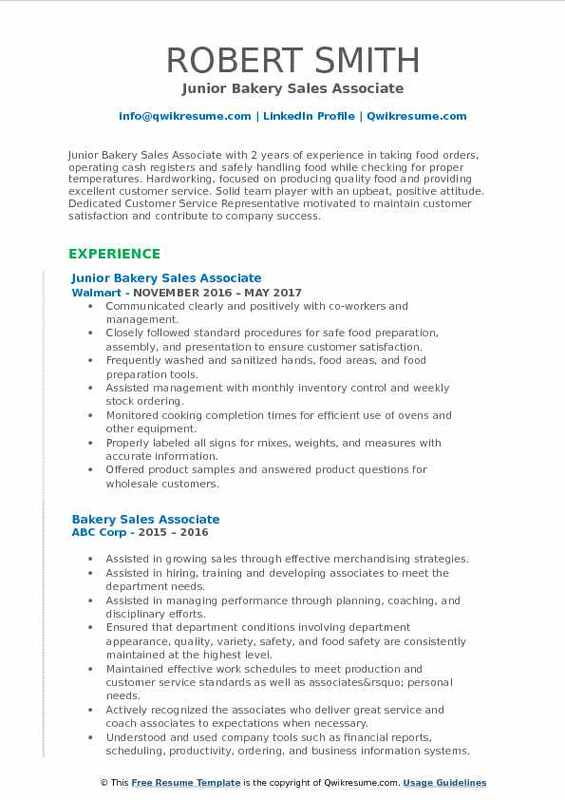 Objective : Jr. Bakery Sales Associate with 3 plus years of experience in the Sales domain is seeking an engaging position which will allow me to launch a career while being able to utilize the knowledge, skills, and abilities gained during my undergraduate studies. Welcoming customers as they arrive at the bakery and respond to their queries regarding baked products. Providing the customers with information on freshly baked products and their ingredients. Assisting the customers in choosing cakes, pastries, cookies, bread, and pies according to their specific tastes. Picking the chosen pieces, inquire how customers would like them to be packed and pack them according to specific instructions. Receiving payment by cash, check and credit cards, vouchers, or automatic debits. Answering the customer's questions, and provide information on procedures or policies. Completing all cleaning, stocking, and organizing tasks in the assigned sales area. Assisting in communicating department and company policies to associates. Summary : Friendly and flexible Bakery Sales Associate I with 9 years of experience and with a proven professional approach towards organizational objectives and job tasks. Trained and experienced in resolving customer complaints and promoting conflict resolution. Determined to utilize and implement transferable skills and knowledge for working efficiently towards productivity. Produced products of consistent quality using the product information guide. Gave details of all the recipes, ingredients and packing standards. Assisted in carrying purchases to customers cars and thank them for their business. Assisted the phone guests by placing incoming orders. Gave cake presentations while performing visual quality control tests. Operated & balanced the point of sale (POS) with accuracy and efficiency. Assisted with opening and closing the bakery according to opening and closing checklists. Kept the retail areas clean, swept and neatly merchandised throughout the day. 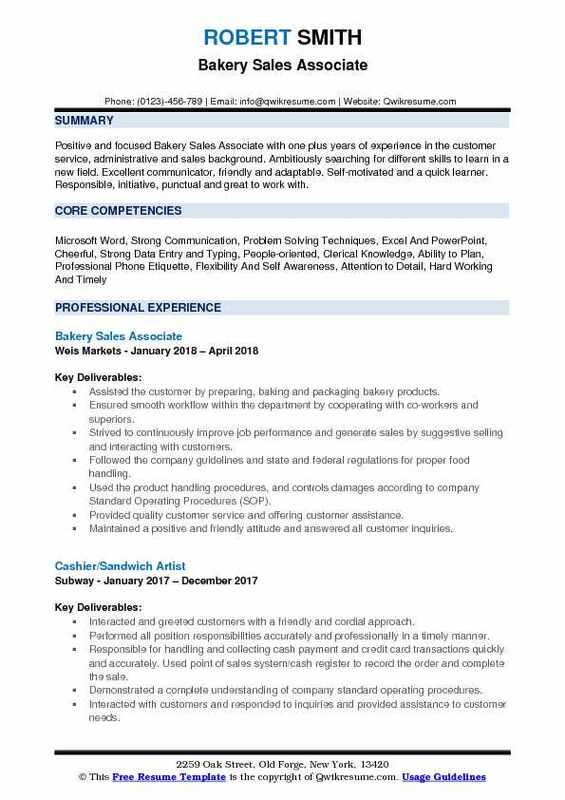 Objective : Bakery Sales Associate with 2 years of experience is looking for a position in a facility where I can perfect my acquired skills, and learn new things to help reach the top of my profession. Ensured that all products or merchandise are placed in their respective areas. Greeted the customers with a positive demeanor and using customer service skills. Followed the company guidelines for providing quality customer service by greeting customers with a smile. Offered assistance, suggesting alternatives when necessary and thanking them for shopping. Maintained a positive and friendly attitude. Answered the customer questions. Ensured fresh quality merchandise by rotating stock, using proper product handling procedures, and controlling damages according to company procedures and standards. Received and unloaded the incoming merchandise. Unpacked the boxes of merchandise, packaged baked goods, and pastries weighed and labelled the baked goods and stock display areas with new merchandise. 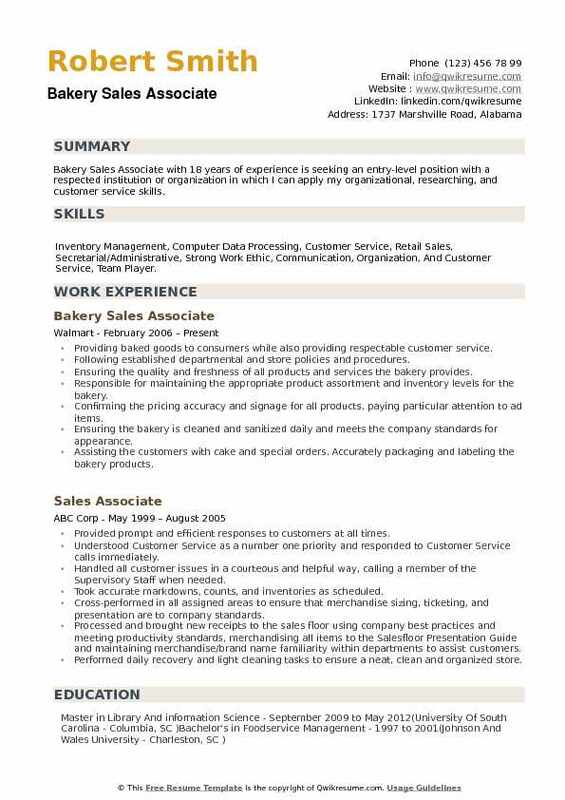 Headline : Dedicated, focused Bakery Sales Associate with 6 years of experience is seeking full or part-time employment in a customer service setting Highly motivated to meet goals and quotas Reliable worker with the ability to quickly learn new concepts and skills Stellar reputation as a team player and passion for serving others, backed by a solid work history. 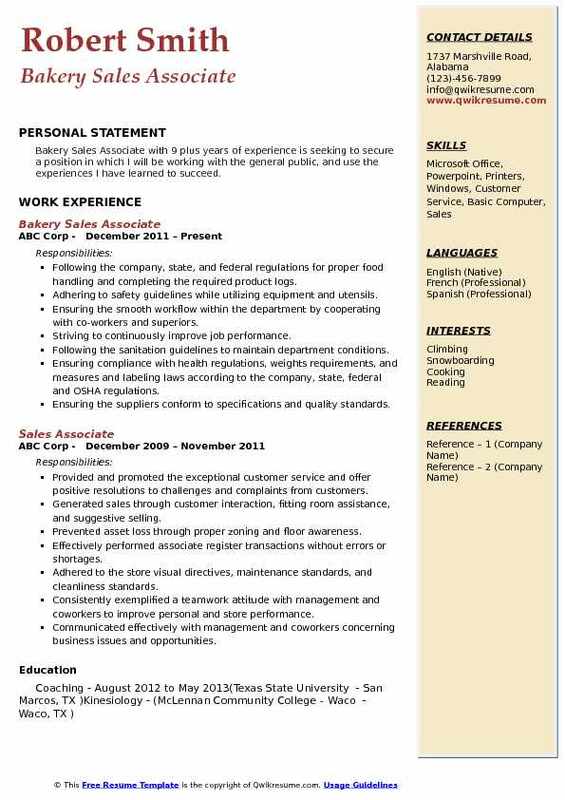 Skills : Computer, Printer, Copier, Fax Machine, Scanner, Telephone And Email. Performed start-to-finish tasks within the Walmart bakery in a time-constrained, fast pace environment. Received "satisfactory" and "above satisfactory" ratings on all performance reviews. Received "victory" cards for multiple laudatory comments from customers and exceptional customer service. Demonstrated the ability to multitask proficiently while meeting and exceeding expectations. Proven to be a go-getter and willing to work overtime to complete last-minute orders and extra break-out of bread and rolls during holiday seasons and peak shopping times. Ensured that product has been properly priced with correct signage. Assisted with ordering and handling special requests from time to time. Responsible for maintaining conditions of the sales floor, cooler, prep area, and backroom to company standards. Generated sales by suggestive selling. 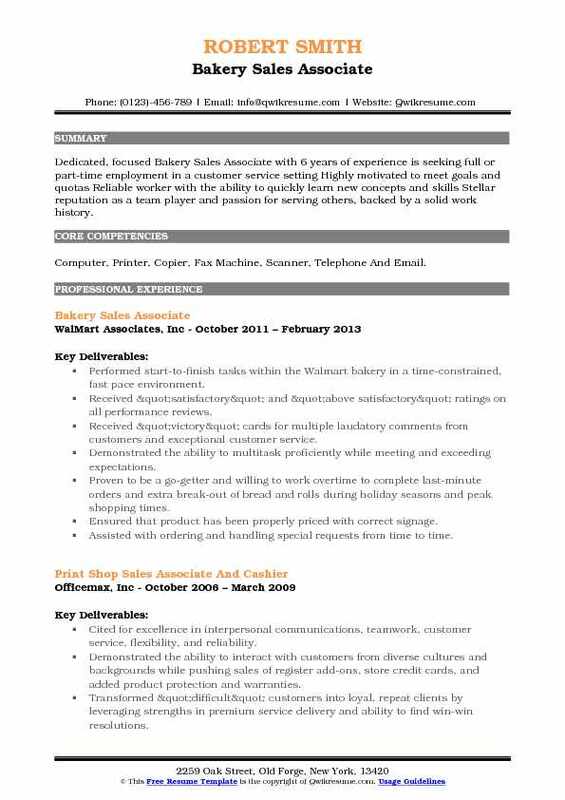 Headline : Bakery Sales Associate with 9 plus years of experience is seeking to secure a position in which I will be working with the general public, and use the experiences I have learned to succeed. Following the company, state, and federal regulations for proper food handling and completing the required product logs. Adhering to safety guidelines while utilizing equipment and utensils. Ensuring the smooth workflow within the department by cooperating with co-workers and superiors. Striving to continuously improve job performance. Following the sanitation guidelines to maintain department conditions. Ensuring compliance with health regulations, weights requirements, and measures and labeling laws according to the company, state, federal and OSHA regulations. Ensuring the suppliers conform to specifications and quality standards. Ensuring the proper product rotation, manage code dated products and vendor returns. Verifying the product pricing accuracy and ensure product signage accurately reflects correct pricing. 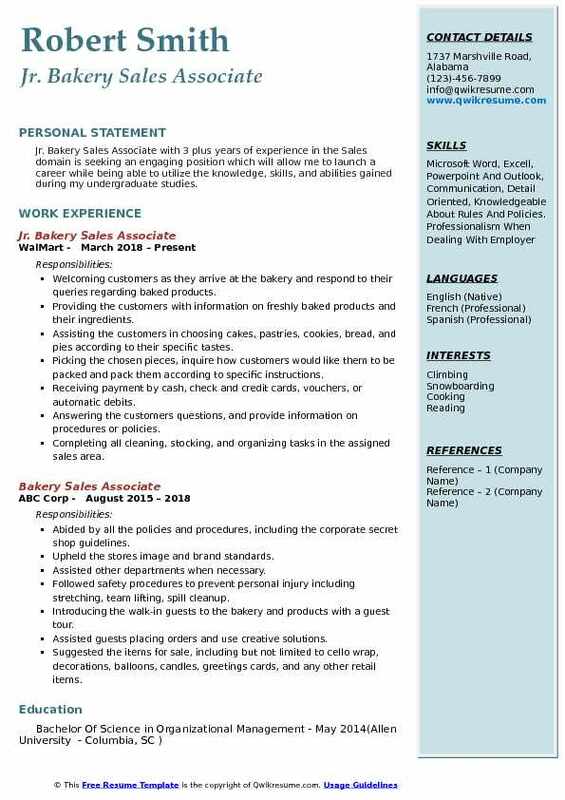 Summary : Bakery Sales Associate with 18 years of experience is seeking an entry-level position with a respected institution or organization in which I can apply my organizational, researching, and customer service skills. 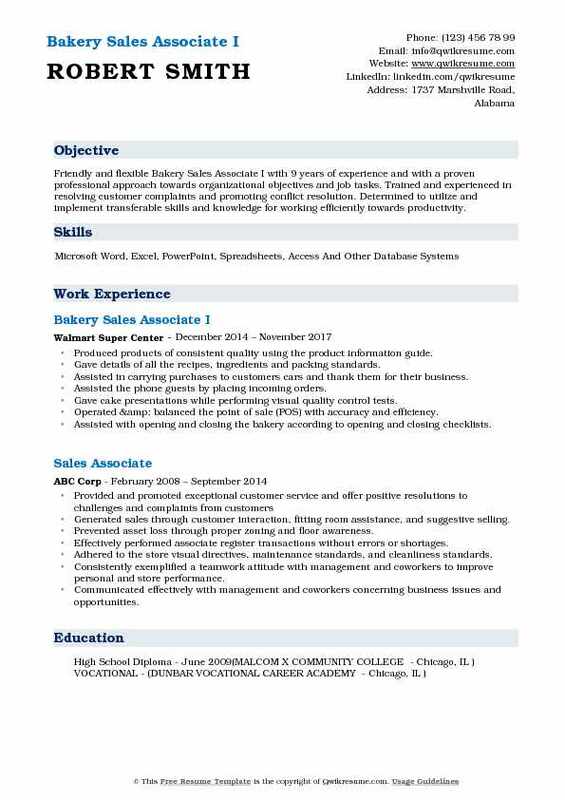 Skills : Inventory Management, Computer Data Processing, Customer Service, Retail Sales, Secretarial/Administrative, Strong Work Ethic, Communication, Organization, And Customer Service, Team Player. Providing baked goods to consumers while also providing respectable customer service. Following established departmental and store policies and procedures. Ensuring the quality and freshness of all products and services the bakery provides. Responsible for maintaining the appropriate product assortment and inventory levels for the bakery. Confirming the pricing accuracy and signage for all products, paying particular attention to ad items. Ensuring the bakery is cleaned and sanitized daily and meets the company standards for appearance. Assisting the customers with cake and special orders. Accurately packaging and labeling the bakery products. Re-stocking the bakery department and helps sort and put away bakery products when deliveries come in. Minimizing waste in the department by following production sheets, watching code dates and appropriately rotating items.